Sense and Sensibility, as many of you will know, is primarily focused on the lovelives of the two eldest Dashwood sisters, Elinor and Marianne. After the death of their father, they are forced into a move to pastures fresh by the stinginess of their half-brother (and the meanness of his wife…). 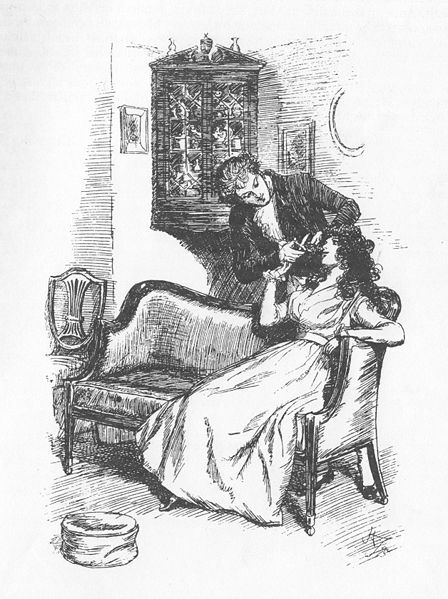 The move takes the sober, rational Elinor away from the man her sister believes her to be engaged to, Edward Ferrars; however, for the impetuous, passionate Marianne, the change of scenery brings with it two very different suitors. Will the two sisters find love and happiness at the end of the novel? …and this is exactly what Austen is aiming to do, as the sisters are more than just characters. They are actually embodiments of two philosophical approaches, with Elinor representing the Enlightenment and Rationalism, while Marianne is the epitome of Romanticism. The reader is able to compare and choose between two modes of life, the scientific and the natural, the cool and the passionate, the reserved and the uninhibited. At first, it appears that the choice is an easy one, as much as we would all enjoy running barefoot up and down hills all summer; however, the longer the novel goes on, the more it becomes apparent that both extremes have their disadvantages. Is it a good book? Of course, but that is pretty much a given, and not the question I’m trying to answer for myself here. Do I like it? Yes, but… There is a lot to like about Sense and Sensibility, not least the metaphorical rope Austen gives her characters, allowing them to commit social suicide at their leisure, but I have a few reservations which affected my enjoyment of the book. Another problem is the resolution of the story and the matrimonial choices made. The last part of the novel seemed rather rushed and contrived, and while Austen certainly justifies her decisions, I can’t say I agree with them (I would have chosen different partners for both Elinor and Marianne!). Certainly, Marianne’s recovery and eventual surrender are very weak to the modern eye. Finally, Sense and Sensibility, unlike other Austen novels I’ve read, seemed horribly claustrophobic. I felt trapped inside Elinor’s point-of-view (not one I particularly enjoyed) while everything of importance was happening elsewhere. Each time the sisters announced that they were to up sticks and visit another part of England, I rejoiced, grateful for the change of pace that would ensue. A great post on a subject that to me is similar to a,medical procedure without the appropriate drugs, have tried this & the others, several times & just don't get them, as you say there are other writers of that period that you don't have issues with & I'm in agreement there. As to the Janeites, let them come, they'd have to get past the Dickensians laying siege at the moment. No outrage from this reader. While I do love Jane Austen, Sense and Sensibility is my least favorite of her books, by a far margin. It's so nice to see someone agree with me! It's a nice enough book, but my issues with the book are identical to yours. I really had a difficult time caring about Elinor. It's been years since I read it, but I remember her coming off as annoying and boring, if that is even possible. With all of Austen's heroines generally marrying for love, I just don't buy that Marianne did. I will have to make sure I read the others as although you know its all going to end happily I do quite enjoy the journey there, S&S is the one I know the least about. Whilst I still think Sense and Sensibility is wonderful, I do know what you mean and I would put a lot of the things you've written down to the fact that this was (I believe) Austen's first novel, so she wasn't necessarily fully into her writing groove yet. And as for the cramped setting, I think that's pretty representative of what women's place in society was at the time, so Austen was basically just writing about how she saw the world. Which doesn't mean you have to like it, obviously! Just that, we can all appreciate and go damn it was hard/boring/claustrophobic to be a woman in 19th century England. Jessica – I'd like to reread those first two at some point – 'Persuasion' is another I wasn't overly keen on (as my review shows!). Austen was a totally brilliant satirist, and that is what she does in her novels. She's hilarious and all kinds of clever in sending up social conventions and the other novels of her day. You should read her letters. She had a wicked sense of humour! Next time you read her, try reading between the lines, because that's where the real stories are. I love Austen at her best – I just don't think S&S is her at her best. I'm not sure she knew exactly where she was going with this one at times.